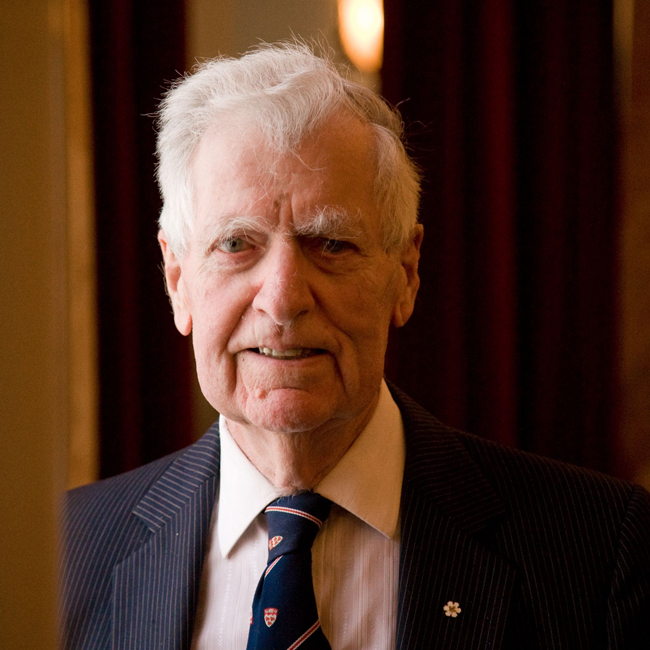 Dr. Richard H. Tomlinson, McGill alumnus, professor emeritus of chemistry at McMaster University, founder of Gennum Corporation, and one of the most significant philanthropists in Canada, died on Sunday, January 28, at the age of 94. With this news, McGill has lost a dedicated graduate and friend whose generosity towards the University and its students stands as a remarkable legacy. Tomlinson made philanthropic history for Canadian universities in 2000 when he donated $64 million to McGill. At the time, it was the largest gift ever made in support of higher education in Canada by an alumnus, and still ranks as the largest single gift McGill has ever received from an individual. Indeed, the Tomlinson donation would prove to have a lasting effect on research, faculty, students and facilities, creating six new research chairs, a prestigious fellowship program for graduate students, a substantial boost for undergraduate scholarships, a major fund for library services and more. Tomlinson was a firm believer in the importance of graduate students to the life of a university, and he saw the pressing need for funding to allow them to explore their passion, pursue ideas, and carry out their work free of financial burden. The hallmark of his gift, the Tomlinson Doctoral Fellowships program, was unprecedented at McGill in its generosity, providing young researchers with up to $35,000 per year, and in its inclusivity, being open to students in every program of study. For nearly 20 years, top graduate students have come to McGill as Tomlinson Scholars, in fields from Oceanic Science to Epidemiology, and Bioresource Engineering to Germanic Languages. Tomlinson was a frequent visitor to campus and maintained a lasting involvement with the programs his funding helped establish. He relished meeting with the winners of the Tomlinson Scientist Awards, which recognize leadership in scientific inquiry and provide seed money for emerging research directions. For years, he attended the Tomlinson Talks, an annual showcase bringing together representatives of the Tomlinson Fellows cohort to share five-minute presentations of their research. When his health no longer permitted him to attend the event in person, he enjoyed watching recordings of the students’ presentations at home in Hamilton. He came from a family of scientists; his father and both brothers shared his inquisitive bent and capacity for invention. As a young man at McGill, Dr. Tomlinson was the last graduate student of legendary McGill chemist Otto Maass, under whom he had worked during the Second World War. Tomlinson completed his PhD at McGill in 1948 and went on to do postdoctoral work at the University of Cambridge, before joining McMaster University’s chemistry department. He enjoyed a career in chemistry that won him national recognition as an academic and success as an inventor and entrepreneur. Following his retirement, he founded Gennum, a Canadian manufacturer of microchips for digital signal processing as well as the world’s largest supplier of microchips for hearing aids. Tomlinson was an enthusiastic golfer and runner who at one time held the national record for the 30-kilometre run in the over-60 age group, and his fondness for track is reflected in the support he provided for McGill Athletics facilities, where the R.H. Tomlinson Fieldhouse and Tomlinson Hall are named after him. In recognition of his lifetime contributions to education, Dr. Tomlinson was made an Officer of the Order of Canada in 2004 and was also a recipient of the Queen Elizabeth II Diamond Jubilee Medal. He received an honorary Doctor of Science degree from McGill in 2001.